Sunday July 26 1908 Soon as we got through the morning work went down to Woolfs. Will is very bad. We did not stay long. I went to church by car. Got our dinners when I came home and slept part of the afternoon. Will and I sat on the porch and talked all the evening. Very warm today. 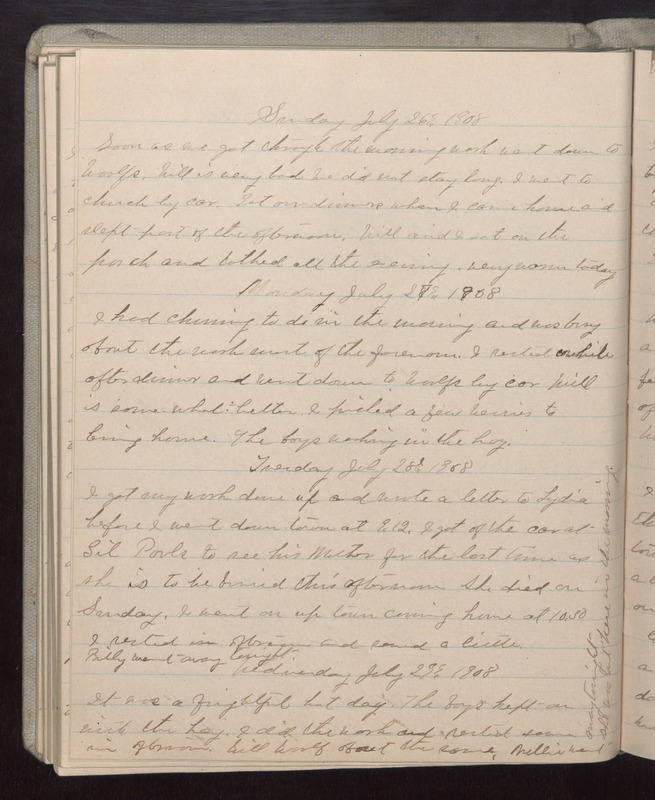 Monday July 27 1908 I had churning to do in the morning and was busy about the work most of the forenoon. I rested awhile after dinner and went down to Woolfs by car Will is some what better. I picked a few berries to bring home. The boys working in the hay. Tuesday July 28 1908 I got my work done up and wrote a letter to Lydia before I went down town at 9.12. I got of the car at [Gil Pauls?] to see his Mother for the last time as she is to be buried this afternoon. She died on Sunday. I went on up town coming home at 10.30. I rested in afternoon and sewed a little. Billy went away tonight. Wednesday July 29 1908 It was a frightful hot day. The boys kept on with the hay. I did the work and rested some in afternoon. Will Woolf about the same. Nellie went away tonight She was out here in the morning.